Aberdeen Harbour Board was delighted to welcome First Minister for Scotland, Nicola Sturgeon, to the port, where it was announced that Scottish Enterprise is to contribute £11.7 million towards the harbour’s £350 million expansion. 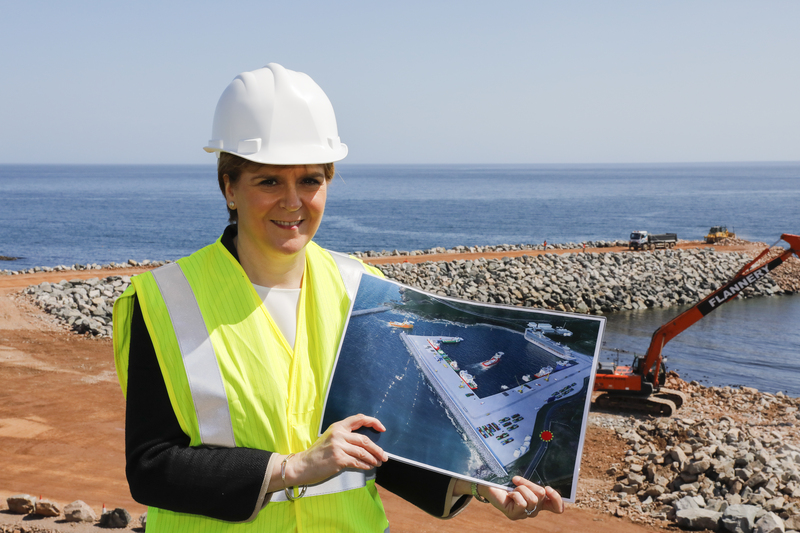 With the expansion project now underway, the First Minister was interested to learn more about the progress and key benefits that the expansion will bring to Aberdeen and its economy, including supporting the creation of 2,300 jobs by 2026. Visiting the harbour, First Minister Nicola Sturgeon said: “Aberdeen Harbour is Scotland’s main oil and gas port and one of Europe’s leading marine support centres for offshore energy. This funding will open up significant opportunities to diversify and exploit the rapid growth in cruise tourism and the renewables markets in Scotland. The expansion will afford existing customers the opportunity to diversify and expand their interests, whilst attracting new customers and markets to the port, including up-scaled decommissioning activity, a more significant share of the available cruise vessel fleet and larger, more cost-effective commercial vessels. The state-of-the-art facilities, due to be completed in 2020, will include 1,400 metres of new quay, with a water depth of up to 10.5 metres. It will also create an additional 125,000 square metres of lay-down area, making it the largest berthage port in Scotland. Colin Parker, Chief Executive of Aberdeen Harbour Board, explained: “This funding is immensely significant. It further demonstrates recognition of this strategic project as one of national and international importance.